Gasoline saw generally uses precompressed gas sweeping type two stroke engine, are cylinder cooling. 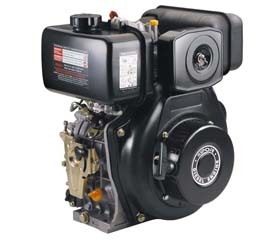 According to the function: gasoline engine by mechanical, electrical, fuel, gas flow of four systems. 1) mechanical system includes cylinder, piston, connecting rod, crankshaft, group box. Role is to achieve the gas seal, under air pressure and mechanical force, guarantee of movement relationship. 2) electrical system includes a magnetic motor, ignition coil, spark plug. Its role is to the crankshaft drive motor to generate electricity, to complete timely ignition cylinder. 3) oil supply system consists of the fuel tank, the fuel tank switch, oil filter, oil tube and the carburetor. Its role is to provide storage and fuel oil, lubricating oil, and the fuel and air mixture into the appropriate proportion of combustible gas. 4) air flow system includes air filter, an air inlet valve, exhaust muffler, role is to provide combustion air, oil into the cylinder and reduce exhaust noise. On power transmission when the crankshaft crankshaft, connecting rod, piston group was implicated, when the piston toward the top of the cylinder ( upward) during exercise, the crankcase to generate negative pressure, the air through the air filter, carburetor with fuel. Through the inlet valve when the piston intake crankcase, cylinder ( down) to deviate from the Department of sports, the crankcase gas is compressed, when scavenging port opening, gas by sweeping the airway pressure into the cylinder, the piston to move upward, in the cylinder is compressed gas, pressure and temperature rise, the electrical appliances ignition and combustion, heating the gas pressure rises further, gas expansion, to push the piston downwards drives the crankshaft to rotate, the output power, when the exhaust port opening, the waste gas after combustion by pressure spraying, the scavenging air sweep the cylinder, the muffler is discharged out of the machine, air intake, compression, expansion, exhaust, go round and begin again, crankshaft continuous rotation, work. Crankshaft idling, the clutch is separated, the crankshaft rotation does not drive the transmission shaft, meet the stop transmission shaft without stopping the need. When the crankshaft speed rises to the clutch engagement speed above, clutch, transmission shaft, drive the machine, the machine to open or stop, fast or slow controlled by a throttle control. This term can refer to various types of gasoline engine power, power energy, power machine can be divided into motor, wind power engine, hydraulic engine. As a mobile power engine, with the thermal energy into mechanical energy of the heat engine is most common, engine” hot” is the fuel through the combustion, combustion in the engine of the engine, called the internal combustion engine, internal combustion engine is a piston type and a rotary impeller structure, common internal combustion engine is a reciprocating piston type the fuel used, with different, internal combustion engine can be divided into gasoline, diesel oil, coal, gasoline engine fueled with gasoline internal combustion engine is.